Mix all ingredients in 3 1/2- to 6-quart slow cooker. Cover and cook on low heat setting 4 to 5 hours (or high heat setting 2 hours to 2 hours 30 minutes) or until desired consistency. Note: This recipe was tested in slow cookers with heating elements in the side and bottom of the cooker, not in cookers that stand only on a heated base. For slow cookers with just a heated base, follow the manufacturer’s directions for layering ingredients and choosing a temperature. 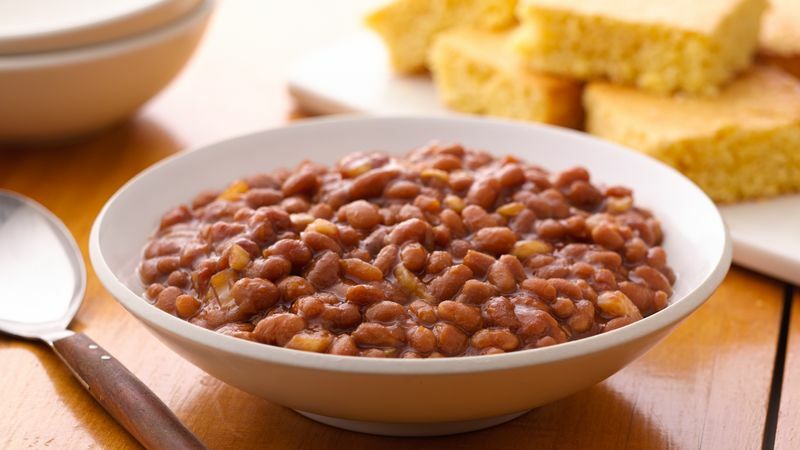 Sprinkle beans with Betty Crocker® Bac~Os® bacon-flavor bits just before serving for that great smoky flavor that goes so well with baked beans. You decide! Change the flavor of your baked beans by changing your barbecue sauce. Sweet, smoky sauces lend a smoother taste, and spicy or bold sauces give your beans a zesty taste.